This rolling mantel showcases a customizable architecture with Premium Oak finish. Perks include locking casters for efficient mobility and non-tipping counterweight. 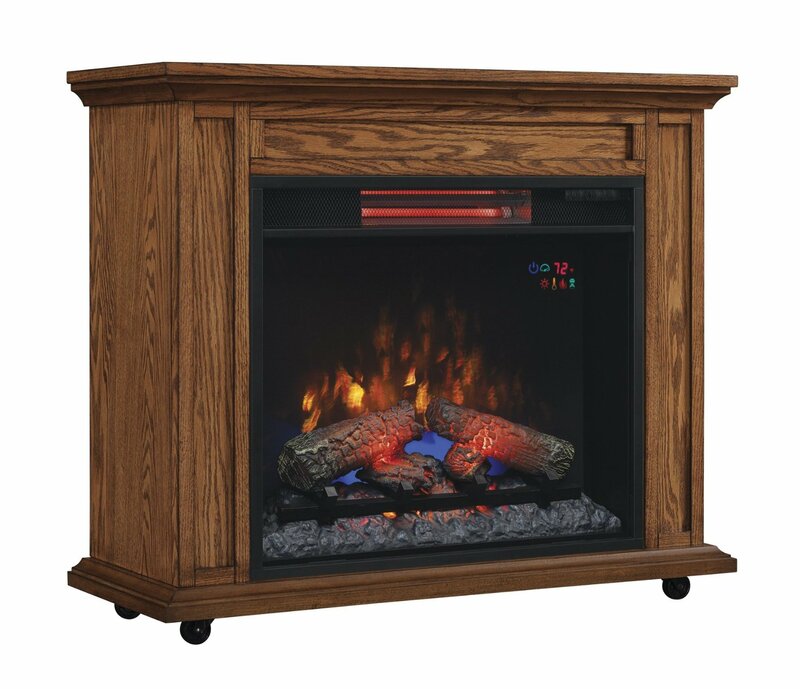 The 23" Infrared Quartz electric fireplace insert that showcases energy-efficient LED Spectrafire Plus flame technology with true resin logs and ember bed. Infrared technology maintains an elegant, moist, safe heat without reducing humidity or oxygen. Dancing Flame effect can be used with or without heat, allow an ambient of a nice rolling fire all year long. The insert also showcases Safer Plug fire prevention technology - the plug has a built-in thermostat that shuts the unit off when it senses that the temperature in the plug starts to elevate. 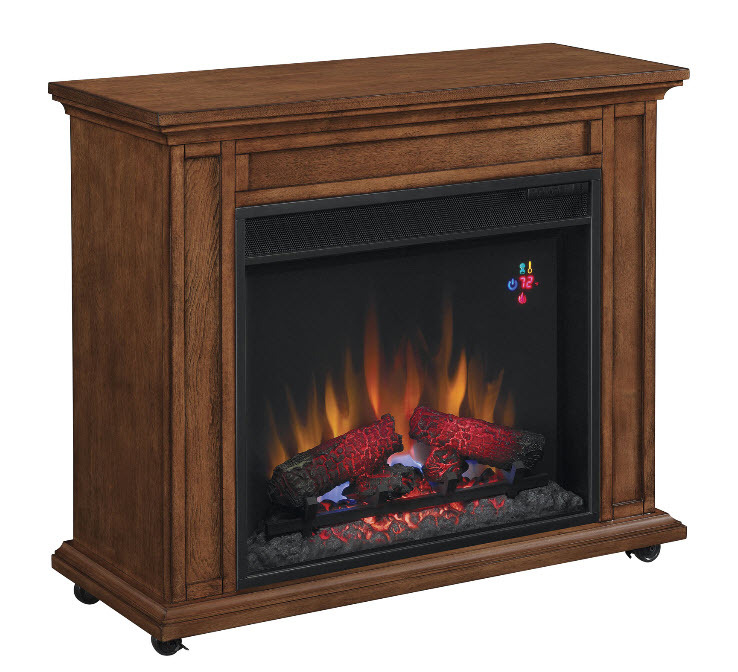 The Spectrafire flame effect technology is front and center in this unit with its stunningly life-like flame effects. Relax as you watch the dancing flames radiate from the realistic log set and ember bed. You'll feel extra comfortable with the soft, warm heat from the fan-forced heater (heats up to 1000 Sq. Ft.). For added convenience, use the included remote to control all the functionalities of the unit from the comfort of your favorite chair. Up to 4600 BTU output of heat with 1350 watt input, these fireplaces can heat a 1000 square foot room in little to no time. No venting or gas lines are needed, simply plug in and enjoy. Realistic resin logs and ember bed included that give the authentic feel of a cozy fire in your home without the pollutants or emissions. Can be used with or without heat, to bring the nice glow of a fire without the heat on warmer days. Enjoy your fireplace year-round without spending extra money on maintaining it or shutting off fuel lines. Can a TV go on top? 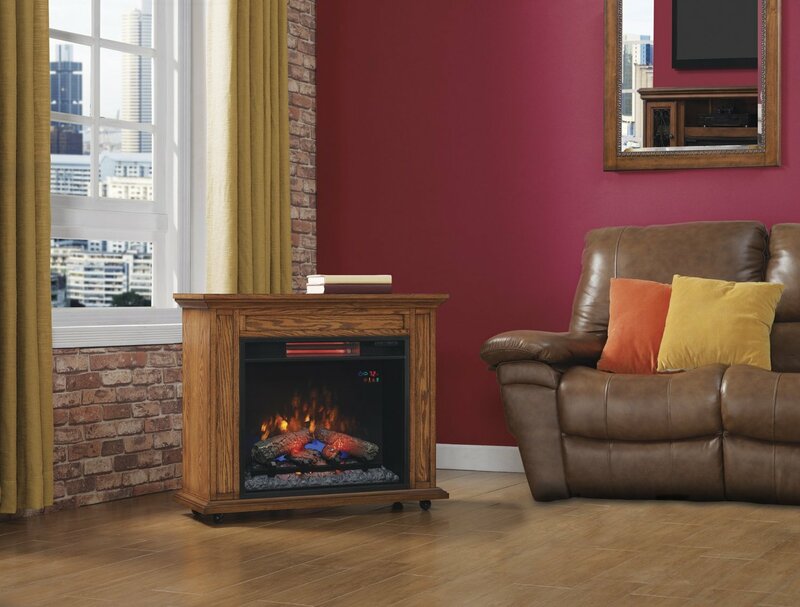 Since this fireplace model has wheels on the bottom we do not recommend placing a TV on top since someone can bump into it and cause the entire unit to shift and potentially knock down the TV. I may be missing where it states this, but how much does this unit weigh? The Net Weight is: 61.6 lbs, which is what the unit will weigh out of the box.